I used to read some poets and writers who went on to claim their magic skills with words, of how they could add colour to the paintings of their artistic masterpieces. Their words provided them with a visual medium for sculpture just like clay or metal. Yet when they chose to narrate the beauty of their beloved, their limitations to express, their vocabulary… failed their magic and heroic juggling with words. They could utter no more than ‘simply beautiful’. I felt the same fear while writing about Swiss beauty of Interlaken. The fear that I will not be able to do justice with this enchanted untouched nature..it is ‘simply beautiful’. Today, I felt a little brave.. to give a try anyway. Driving through France we arrived in Switzerland. 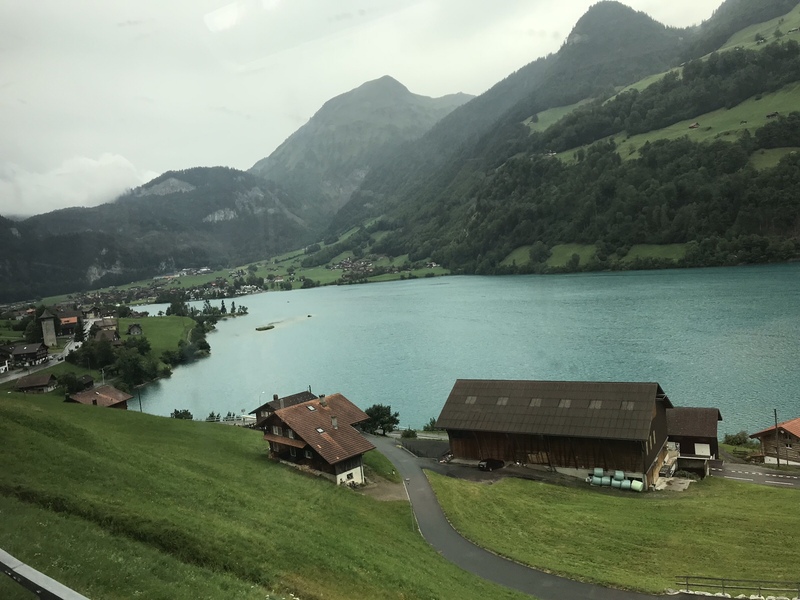 This long drive towards Interlaken made us go through a number of very long road tunnels… so long that I looked forward to a better signal and day light each time…. It is not a surprise that world’s longest Gotthard base railway tunnel is in Swiss alps that is 35m (57km) long. These long, dark tunnels provided us with a mystery and complete contrast to what we were about to witness next. Soon the tunnels were taken over by steep alpine pastures and scree slopes. White clouds floated very low, they felt like at arm’s length. It took us a while to believe the fact that they were real clouds. Nature looked so unreal in its pure, untouched and raw form… almost dream like, a fantasy and imagination.. I could not tell if it was the alp mountains, the lush green valleys, the blue sky, white clouds or turquoise lakes that gave the view a mesmerising charm. Perhaps it was the altitude, weather, fresh air, grandeur of mountains, sound of waterfalls and lakes. However, I quickly decided it was the sloping valley, the positioning and the architecture that made it look all the more special too. The house were widespread down the valley. Wooden houses with longstanding wood carving tradition, wooden shutters and flowers outside windows, with mostly chocolate brown colour… these houses were made to look in complete harmony…. nature and architecture… intermingled… complementing and doing justice to each other. It was very late in the evening when we arrived at our resort. It was right next to a camping and caravanning club. A number of people could be seen having dinner outside the communal kitchen in the midst of serene Interlaken wild beauty. While our room looked a little compromised to what we expected, the outside view through the window was an absolute delight. When you open your curtains to see mountains, lake, ducks and cruises with people waving at you, you think twice before moaning about inadequacies of expectations vs reality. To have food in the restaurant of our resort was not too bad. Asian, authentic, spicy and halal food in the midst of Switzerland is a luxury itself. We had a very spicy chicken Karahi that turned out to be achari… the waiting time was somehow so long that the sight of food flooded every other intellectual emotion. Food was very expensive and so was the cost and fare of everything else. Being the world’s most expensive country for visit according to World Economic Forum… it added to the surprise package of Swiss land. Our friends joined us at this time….which made the mode of party full on. After a short walk, with my friend, while admiring the night beauty galore of Interlaken and fearing any fox or wandering lose dog passing by so late at night.. we finally said good night to each other and went to sleep feeling tired yet excited for the next day with much yearned cup of tea. Writing is my medium to spread the colours of hope. We all go through times of high and low. What’s important is our response, the struggle, the survival and the positivity. Trying to pass on through my writing, that beacon of light, that magnet of gratitude and key of hope that we all desperately need from time to time.